We finished the Mount Hood section in Oregon and the fires in northern Washington are still going. But we are determined to get to Canada this year, and we have a plan. In fact, several plans. We stayed 3 days in Cascade Locks to give Turtle’s ankle a chance to heal. It’s somewhat better now. We chose to travel on Saturday and I woke feeling nauseous; I couldn’t eat breakfast but I felt good enough to travel. We got a hitch into Portland then walked the 2.5 miles to the Amtrak station. Our main plan assumed highway-20 would still be closed, so we would take Amtrak to Everett, WA. From there we’d take a bus on hwy-2 to Wenatchee, then another bus to Chelan, on Lake Chelan. 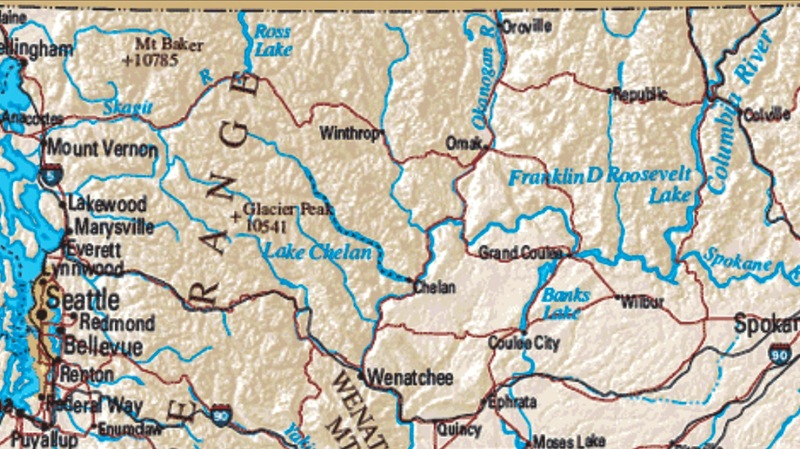 From Chelan we’d take a ferry 60 miles to Stehekin at the far northern end of the lake. (A 6 hr ride) we can hike out of Stehekin to Canada. We figure this Convoluted route would take 2-3 days to do. Then we just heard the news that Hwy-20 will be open Sunday afternoon! Plan-B is to take Amtrak to Mount Vernon then hitch on highway-20 to the trail at Rainy Pass and hike to Canada from there. Plan-B would cut 20 miles of trail and save 1-2 travel days. So we chose Plan-B. We had heard there were storms hitting Washington with 60 mph winds while we were in Portland. It was breezy on the walk over, but nice otherwise. We left Portland on Amtrak on time at 2:50pm and were supposed to arrive at Mount Vernon at 8:30pm. When we were in route I checked for hotels there: everything was booked! Same for the town just north, Burlington which was actually on Hwy-20. It seems there was a bike race Sunday and people booked everything. The next stop for Amtrak was the town of Bellingham, 20 miles to the north of Burlington. It’s a much larger town with 3 times the hotels and seemed a good choice. The Expedia app said there were over 10 with rooms, but I when tried calling a couple there was no answer. Not feeling good, I just went back to sleep figuring it would work out later. The train made Seattle, then Everett with no issue. Then the problems started: power outages at crossings and trees on the tracks. The wind storm had been really bad in northern Washington. One delay after the other. We didn’t arrive at Bellingham until 12:30am. While we sat waiting I tried to book a room and found most of the city was under a power blackout. The few hotels that weren’t were already full. We began to despair. Meanwhile I was still sick and felt awful. When we arrived I called a cab and asked him to find us a room. It took a while, but he did! We finally settled into bed at 1:30am, exhausted. We slept until 9am, Sunday and I was no better; still feeling awful. We decided to spend another night in Bellingham and travel on Monday. It did give us time to map out a bus route from here to Burlington, then up Hwy-20. I stayed in bed and Turtle walked a mile and a half to the market. Albertsons still had a power problem and had already thrown away everything in the refrigerated and freezer sections. He couldn’t purchase any cheese! Later we both walked to another market and got that. The bus system is pretty good here. We got the transfer to the 80x bus south to Burlington where we will grab a couple of other buses up Hwy-20 halfway to our goal. We figure we can hitch the rest of the way. You skipped a majority of Washington. Was it because of Turtles ankle? Actually we hiked most of Washington already. There is the section north of Suiattle that is closed, and the 18-20 mile section close to Stehekin to Rainy Pass, maybe 50 miles total, that we haven’t hiked. Prayers and best wishes to you guys! Mike, you are having an enviable trip! So glad that you just were down only a few days by an opportunistic bug. Just proves the saying: You can’t keep a good man down! Take care … and by the way, your cousin, Suzanne, was visiting her daughter in Washington state the day of the big power outage. First, they crossed a bridge where waves were coming over the sides … a bit freeky … then they decided to get something to eat. Found a candlelight restaurant & thought, “Oh it’s just ambiance” … like fun… it was a power outage & they weren’t told of it until it came time to pay and then they said they couldn’t accept a charge because they had no power! Thankfully, between the two of them, they were able to cough up the cash! Lessen learned: All candlelight restaurants aren’t doing it for the ambiance!